Agritechnica 2017, took place in Hannover/Germany from 12 to 18 November, again proves its global leading role in agricultural sector, with 2.803 exhibitors and 450.000 visitors, including more than 100,000 from outside Germany. 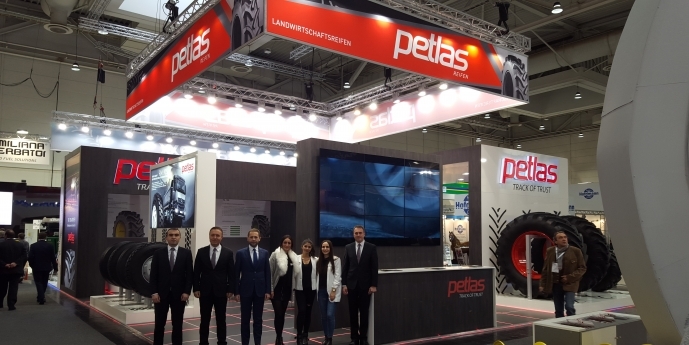 2,803 companies from 53 countries, including the world's leading manufacturers, showed a full range of tractors, farm machinery, equipment, spare parts and accessories As Petlas Tire Corp. we were in our booth located Hall 3 Stand B25. In this important fair organization, we had opportunity to exhibit our TBR-Agricultural and OTR range. We would like to thank all of our business partners, and guests for visiting our booth and taking part in this great event. Inputs from discussions with our business partners, and feedbacks from the end-users are indeed inspiring. We hope that your visit to our stand was enjoyable, and informative. Agritechnica that is world’s leading exhibition for agricultural machinery and equipment held in every two years.